Why do most basement floor coverings periodically need to be replaced? It's because of the concrete and the moisture. Concrete is porous and damp. Moisture and dampness migrate up through the concrete and get trapped beneath carpet, tile, wood, linoleum and paint, not allowing for normal evaporation to dry things out. This results in mold and mildew forming beneath carpeting, tiles becoming loose, and paint blistering and peeling. Nature Stone is designed to breathe allowing evaporation to take place naturally and eliminating these common problems. Why is Nature Stone so highly regarded for covering basement and garage concrete floors? While it may not look like it, a great deal of engineering and design go into creating a product that's suitable for use over concrete. The correct blend of stone and a specifically formulated, patent-pending epoxy, developed and used exclusively by Nature Stone, ensures that the floor covering will breathe naturally. That's why moisture, and even flooding, won't affect the long-term performance of Nature Stone flooring. Is Nature Stone a common solution for concrete floor issues? Absolutely. 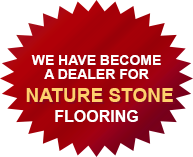 For over 20 years Nature Stone has been the most trusted brand of stone and epoxy flooring. In fact, there are over 30,000 satisfied customers who are proud to show off their Nature Stone floor. That translates to over 10 million square feet of basement, garage and outdoor living. I keep hearing about the special epoxy. What's so special? Long ago, Nature Stone committed itself to providing the industry's best-looking and longest-lasting stone and epoxy flooring. That required Nature Stone to improve on the standard epoxy currently used by competitors. Today, Nature Stone formulates and manufactures its own patent-pending epoxy resin developed specifically for use with stone and epoxy flooring. In addition, Nature Stone also formulates and manufactures the non-yellowing and UV resistant top coat that is critical to long-lasting, beautiful appearance. What is meant by the proper stone mix ratio? Depending on the make-u of a particular stone type, varying amounts of epoxy resin are required to ensure proper stone-to-stone bonding, as well as bonding to the concrete floor. Nature Stone was the first to recognize the need for expansion strips in its stone and epoxy flooring to help ensure the integrity and strength of its floors. Nature Stone has these expansion strips manufactured specifically for stone and epoxy applications. Are there industry standards for stone and epoxy flooring? We wish there were. Instead, Nature Stone invests heavily in continuing research and development and regularly tests for compression strength, elongation, acoustical and insulation properties ("R" Value), flammability, mold and mildew resistance, non-skid properties, chemical resistance, and adhesion quality. Nature Stone meets or exceeds all ASTM standards. Why is it important to have all decision-makers present for the Nature Stone in-home sales presentation and estimate? We get that question a lot. And there's a good answer. We have found over the years that homeowners usually prefer it that way. By having all decision-makers present, it actually helps simplify the education and buying process for the homeowners. What's important for one person (say, the technical specifications and excellent "R" Value) may not be important to the other. They may be more interested in the color or border or graphic possibilities. With everyone together, all questions can be addressed on the spot. Further, the quicker the homeowners get all the information they need, the sooner they can make an informed decision - and start enjoying their beautiful Nature Stone floor.